ETC was established in February 2005 by Mr. Naji Sfeir, author, engineer and experienced professor. Mr. Sfeir teaches computer graphics at ALBA, AUB, LAU, and NDU Universities. In 1987, he graduated from The Ohio State University as an industrial and systems engineer. He is currently an Autodesk, an Adobe and a V-Ray certified instructor. 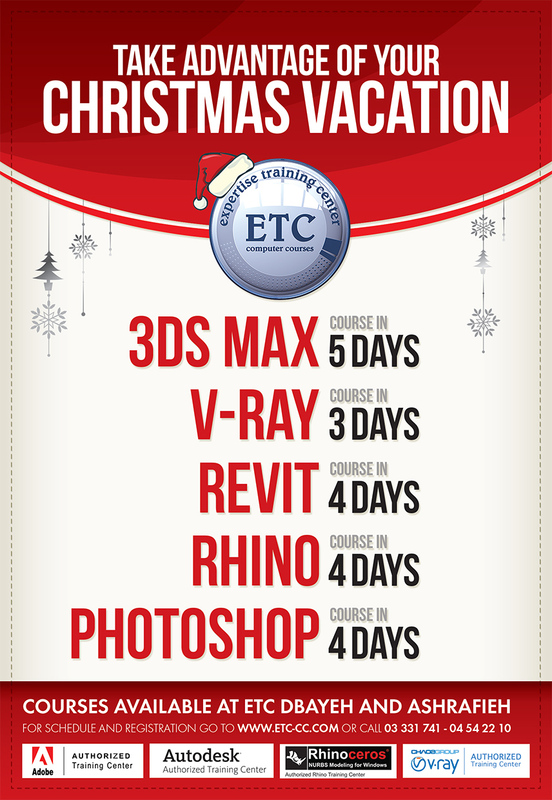 ETC is an authorized training center for Autodesk, Rhino, Adobe and V-Ray. Learn and become internationally certified. ETC focuses on specializing in engineering and presentation software mainly from Autodesk, CSI, IES, Adobe, Rhino, V-Ray, and Primavera. This strategy makes ETC the leader in offering training solutions to large corporations as well as to young university students. Some of our clients are MAN Enterprise, Dar Al Handassa, Al Mabani, NESMA, Rafik Khoury, ETEC, ACE, SABIS, MZ, ACC, etc. In 2014, we helped ETC BIM manage the development of the Bahrain Airport extension. In 2015, we are helping MAN Enterprise BIM manage the development of the ABC mall Verdun Street. our Reference page contains a list of the companies we worked with. Our teachers are certified by Autodesk, CSI, IES, Adobe, Rhino, V-Ray, and other institutions. Step by step, you will master the techniques of each course. We will walk you painlessly through every phase of the use of each application up to practical levels. We have the expertise to develop and research new courses which makes us unique. For some of our courses, we have developed books with international standards . Our schedule is flexible. We offer evening, morning and weekend courses. Our courses are available at our branches as well as the clients' locations in Lebanon and in the Middle East. Our classrooms are spacious and equipped with interactive boards, LCD projectors or large TVs; each student is assigned a comfortable space and a separate computer. You do not have to pre-register to attend a course. You may try us for one session before registering. Our mission is to deliver extensive courses on state-of-the-art software applications to allow our students to advance their careers, increase their income, and improve their life. Therefore, we provide employers with highly trained and motivated individuals who have the skills to meet the technical challenges of a demanding market. Instead of offering our clients three courses in one, we do quite the opposite. For example, on 3ds Max we offer seven specialized courses: level 1 for architects and interior designers, level 2 rendering with Vray, level 3 animation, level 4 modeling, level 5 landscaping and environment, level 6 lighting techniques, and level 7 material and texturing. Professionalism takes time. In 2005, ETC was the first training center to offer courses on Vray. In 2006, ETC was the first to introduce Revit Architecture to the Lebanese market. In 2007 ETC signed the first Revit contract with Dar Al-Handasah. Because of the success many companies and organizations followed such BEMCO, ACE Construction, The Lebanese Army Engineering Directorate, Total Nigeria, etc. On the ETC web site www.etc-cc.com, the Reference page is full of company names and software taught. In 2011, ETC became authorized training center for Autodesk and Rhino. In 2012, ETC became authorized training center for Adobe and Vray. In 2015, ETC started to offer ETABS and SAFE courses from CSI. By committing to quality control, offering courses based on objectives, and issuing international certifications from renowned companies, ETC is expected to become the leading computer training center in the Middle East.